First off, thanks to Orbit Books for my review copy of this book. Secondly, thanks to author Josiah Bancroft for completing the seemingly insurmountable task of writing a better book than his first. Kudos, claps, & congrats! Also quick disclaimer: this review contains SPOILERS for SENLIN ASCENDS, but NO SPOILERS for ARM OF THE SPHINX. 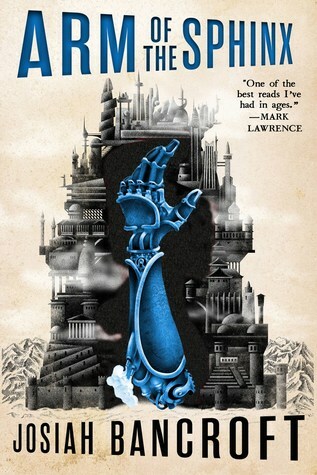 I’m assuming, gentle reader, that you have at this point read and completed Senlin Ascends and are trying to decide to read Arm of the Sphinx, which should really be the next natural move, or are perhaps curious about another’s thoughts after having read Arm of the Sphinx. Arm of the Sphinx begins very near where Senlin Ascends left off, with Thomas Senlin (now under nom de plume Tom Mudd) the newly-minted captain of The Stone Cloud, a rugged commandeered airship. Senlin is very much unwelcome at the port of New Babel, after having upset the order in the Port of Goll quite a bit. Senlin knows that his wife, Marya, was most recently seen in Pelphia, but the port doesn’t take kindly to Senlin’s pirating and makes landing there impossible. Senlin tries to keep his crew alive on the aerial outskirts of the tower, and he struggles to retain his civility so that he can return to Marya as the same man she married. This leads, invariably, to some very courteous pirating. This is all complicated somewhat by the fact that a hallucination of Marya haunts Senlin at inconvenient intervals. Can Senlin stay true to himself as a pirate captain? Can he find a way into Pelphia? Will he find Marya, and will she even recognize him if he does? The Tower of Babel, and its mysterious Sphinx, could perhaps hold the answers. So? How was it? Did Senlin get to the top of the tower already? He sure did, then he just hopped off with Marya and they flew back home to live in peace and quiet happily ever after. A pleasing amount of Arm of the Sphinx is from the perspectives of Senlin’s crew – Edith (who perhaps has a secret), Iren (who is much more than muscle), Adam (who begins to have aspirations for his future), and Voleta (who has more guile than she lets on). These POVs are an absolute enrichment to the book and are great foils for Senlin in many ways. The best authors, I think, are ones who can dance around an emotion without being heavy-handed in expressing it. Josiah Bancroft accomplishes this feat in spades. Reading Arm of the Sphinx, I felt a multitude of emotions not only for Senlin, but for every member of the crew. I felt a sweet and subtle friendship with Edith and Senlin’s door-knocking, I felt proud of Iren’s blossoming, previously-smothered motherly instincts. I loved Voleta’s curiosity and disregard for rules, and, having a sister, I connected with Adam’s love for his sister and his desire to dream for himself. Arm of the Sphinx is full of character, which absolutely worked for me. But Arm of the Sphinx does have less alarming and strange spectacles than Senlin Ascends does. That’s not to say it’s devoid of spectacle, it’s just not the point of this book. There are new venues just as amazing as the first few ringdoms, but I won’t get into details. Suffice it to say, the stuff you love is still there. Number 3: THE SPHINX, JUST IN GENERAL. WOW. There’s a lot more I loved, but it’s getting late. 10/10, will read again. 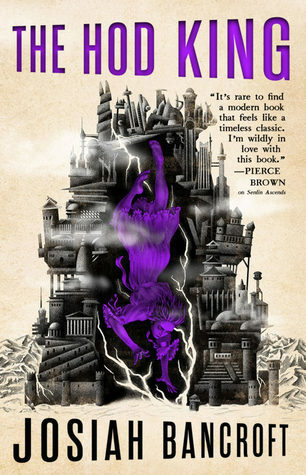 You can pick up Arm of the Sphinx at your local bookstore or on Amazon. Wow, high praise! I enjoyed the first book, maybe not as much as some others, but my plan was always to continue the series. Now I’m excited to start this! I have a dusty copy waiting for me, it’s been a tough month I guess😁 But I’m hoping some time will open up in May. I’m super excited that you enjoyed this even more than Senlin Ascends!